Description : This new web based computing service will offers you an impressive list of well designed features: Hard Drive-Save, backup or share your files and access them from anywhere. E-Mail-Import all your accounts into your web mail. Address Book-Search and exchange addresses, even with users of other systems. Website Editor. 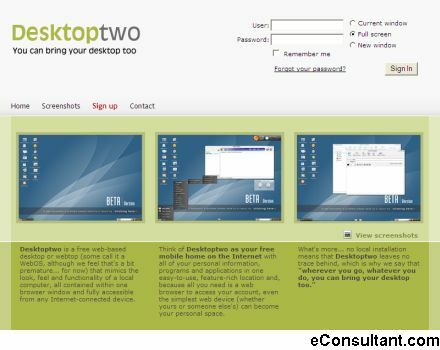 Blog publishing-Let you even include music and pictures from Desktoptwo onto your blog. IM client-you can set up your MSN account. MP3 Player-Store and play your favorite tunes from anywhere. Programs Admin. Browser.